So I've decided that the best way to avoid crashing this laptop is to stop loading it up with extra software. I purchased a second laptop last week and moved all my general purpose software there, while my old laptop will now be my digital audio workstation. I'm hoping this will help me avoid having to skip weeks because some software not related to the podcast's production crashed this laptop's audio system. I'll put that stuff on the other laptop instead. OK, didn’t you go with a PC over a Mac due to expense, and now you’ve had to buy a second PC to compensate? hmmmm. 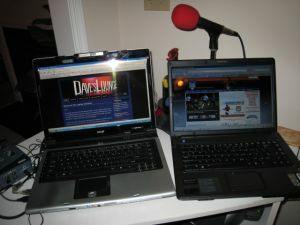 I was going to end up with two computers — one for audio, one for general use — no matter what I did. Right now, switching to a Mac is still far too expensive a proposition. Besides, the low-end Macbooks have build quality issues that I find troubling, and Macbook Pro and Air are well out of my price range — unless I want to go back into debt, and I worked too hard to pay off my credit cards to do that now. I suppose I could have gone with an iMac, but even that would have cost twice as much as my new laptop, and on top of that, I would have had to purchase new VST plugins (or AU equivalents) to replace the ones I use now. That adds up in a hurry. Thanks for the Club do Samba song “Manreza.” All I can say is WOW! I am currently replaying it while sipping some ice-tea on my terrace and watching the sun set in Boston. Thanks man! You rock! I’ve been a fan since episode #2!